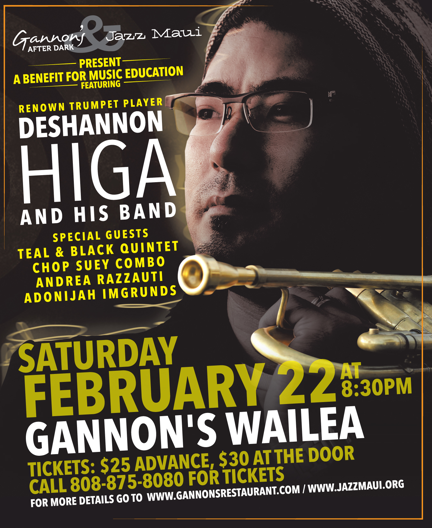 An unprecedented evening of jazz music is planned for Saturday, February 22, 2014 at Gannon’s in Wailea in support of music education on Maui. The Deshannon Higa Benefit Jazz Concert was organized with Jazz Maui and Gannon’s After Dark to raise awareness and funding for the Arts Education for Children Group (AECG). Renown trumpet player Deshannon Higa and his band will perform and feature jam sessions with special guest musicians comprised of local professionals, teachers and students in a showcase of Maui’s jazz studies programs. Individual performances and jam sessions will feature guest musicians including the select student combo Teal & Black Quintet, jazz instructor group Chop Suey Combo, and internationally acclaimed musicians Andrea Razzauti and Adonijah Imgrund. Gannon’s After Dark is an after hours venue at Gannon’s, A Pacific View Restaurant in Wailea featuring live music concert series and dance parties. Gannon’s After Dark is committed to featuring live music performances of local and visiting artists in a warm, intimate atmosphere for a rich musical experience. Tickets are $25 in advance or $30 at the door and can be purchased by calling Gannon’s at 808-875-8080. Concert begins at 8:30pm and will conclude when the trumpet stops blowing.